He always woke up in the afternoon. Then he went fishing on the river until evening. Uder never helped his wife. That’s why she always worked alone in the field. She never gave up giving him advice. But, Uder never listened to his wife. In one afternoon, Uder went fishing. He took some worms as bait. On the way to the river, he met his neighbor. “I’m going fishing,” said Uder. Then he continued walking. Then he met another neighbor. Again, the neighbor asked where Uder was going and what he had for the bait. Uder answered. After that, he met another neighbor. He also asked the same question. Uder was tired of answering. He was upset. So he decided to ignore everyone. While he was walking very fast, he met a group of monkeys. They could talk like humans. “Hey Uder, are you going fishing?” asked one of the monkeys. Uder was still upset with all those same questions. This time he could not take it anymore. “I’m going to use your mother for the bait!” said Uder. “Hey! Don’t make fun with my mother!” Those monkeys were angry. They took Uder. 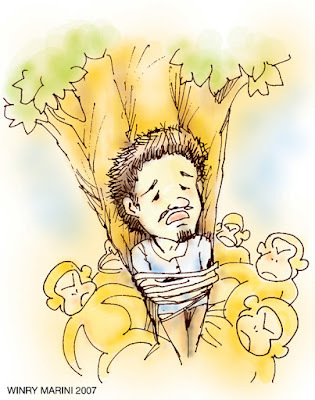 Then they tied him in a big tree. “Please forgive me. I did not mean to make fun with your mother. I was just upset with all those questions my neighbors had asked me.” explained Uder.